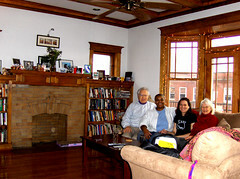 This is Dad, Gillian, me, and Mary (from left to right) in the living room of our Chicago apartment. They came to visit us between Christmas and New Years in 2007, and had a great time. We did an architecture tour by bus on a frigid day (it was super fun), had some really great food, and enjoyed a much over-due visit. I’m so glad to be in closer proximity.